Also Gwen as Spiderman is coming up in Edge of the Spiderverse! This is now the third installment in the ongoing series of articles where I tell you what comics I pre-order at my local comic book shop. I really hesitate to call this the last article in the series because, let's be real, comics are a fluid and changing medium. Some of these comics will be cancelled before the year is out. Other comics have been announced, but will later come out and I will love them and put them on my list. Still other comics have yet to be announced, or even thought of, and invariably I will love some of those and put them on my list too! What I'm saying is that a pull list is a changing thing. Some comics you love, and then you get over, whether because they switched writers or because you're just kind of done with them. Some comics you find you can't quit no matter how hard you try. And some comics end before their time. But there are always new comics coming, and to my great and visible delight, a lot of these new comics are much more visibly diverse than their predecessors. In fact, I would say that on a whole, comics are becoming increasingly inclusive and representative as an art form. So, with all of that in mind, as well as the understanding that this list is probably incomplete because, as with everything I do, I consume a lot of comics*, here's the some more of my pull list! I have absolutely no idea what to make of this comic, and I'm kind of okay with that. I know that's an odd start, but it's very true. For all that there are now three issues of this comic available, I still don't feel like I fully grok it. But I'll try to explain it anyways. 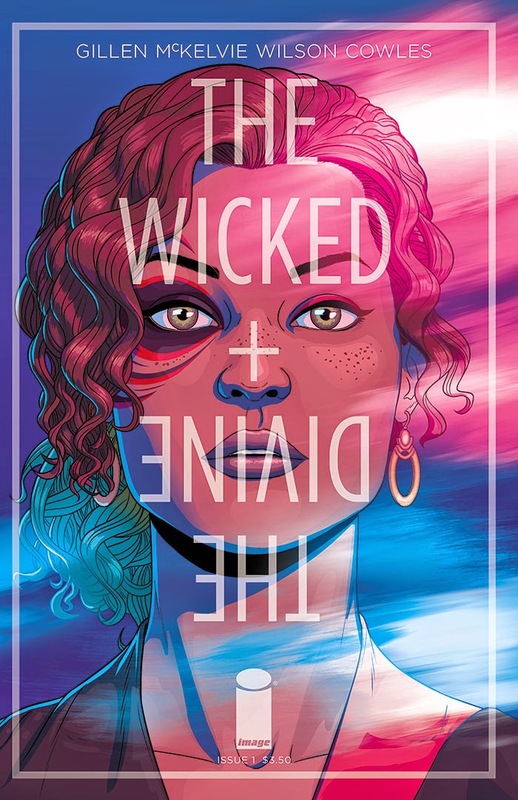 Wicked and Divine takes place in an alternate universe of sorts where the gods are real, and they are reincarnated every ninety years into the bodies of a group people in their late teens/early twenties. The group is completely random each time, but suddenly, they are gods, and they are worshipped and revered for two years. Then they die. No one really understands why the cycle exists, or how to get out of it, and for the gods trapped inside it's a terrifying existence. They know they're going to die, they just don't know what happens next. But it seems that they have bigger problems: one of the gods (presumably) is killing people and framing gods for it. Why? They don't know. But it's definitely a problem. I like this because it's just so stinking weird and confusing and weird, but also because it's a truly compelling mystery, and because the writing is pretty good. It doesn't hurt that the art style is nice, and the writers have chosen very intentionally to make their characters multi-racial and multi-lingual, so as to avoid cultural centrism. I like that. But mostly I'm keeping reading until I figure out what the heck is going on, you know? 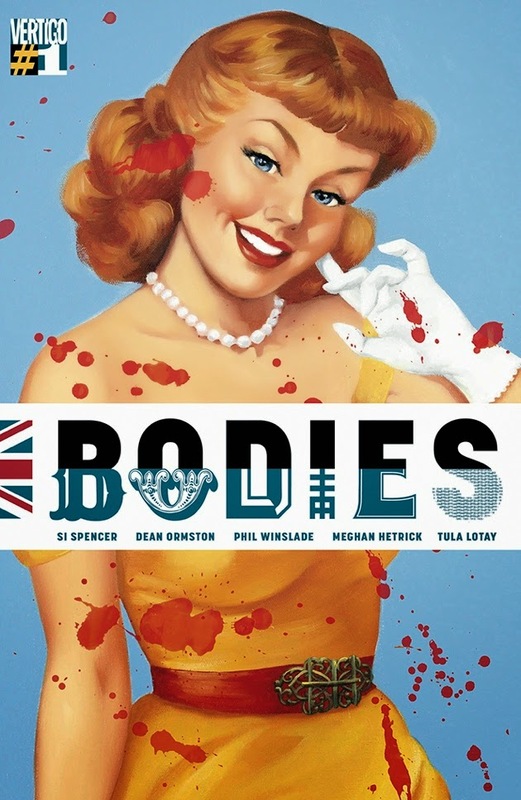 And, speaking of stories that I don't really understand but am intrigued by, Bodies is another weird one. It's brand new, but I can tell it's going to be amazing. It had better be amazing, because I'm hooked, and I hate being hooked on things that turn out to be terrible. Anyway, the story is actually four stories, told each issue and illustrated by a different artist. The stories each revolve around a cop in London discovering a mysterious body. The stories take place in four very distinct time periods, and the one link between them is that the body they all find is exactly the same. The four time periods also make an effort to discuss real and important issues of self, identity, and what it means to protect the people even when they hate you. There's one story set in Victorian London, with a gay male detective trying to investigate crimes and not be outed and then executed, and another story about a German Jewish cop trying make a new life for himself in London during WWII. There's a female Muslim detective inspector in present-day London, facing off against race riots and nationalist backlash, and there's a really weird story set in the future where everyone has been hit by an amnesia pulse, including the cop. That one's kind of confusing. But fun. I like the story because it very explicitly deals with questions of identity and duty and sacrifice, but also because these characters all feel very real to me (except amnesia cop lady). They're real people, in real situations, and those real situations are pretty messed up. And I would like to know what's up with the bodies. This is also a brand new comic (surprise! ), but kind of a really old one too. Basically, way back when, Wonder Woman had two titles coming out every month. 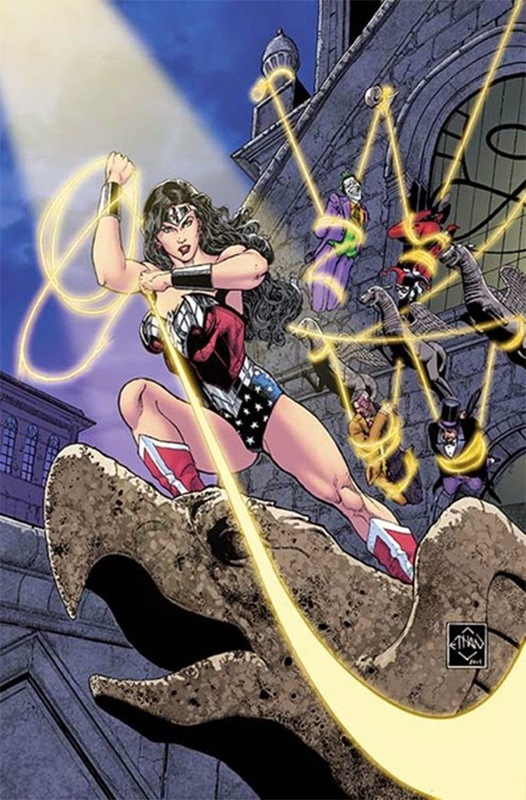 There was the Wonder Woman comic, which we all know and love, and then there was also Sensation Comics, an anthology series featuring Wonder Woman, that got to tell all the weird different stories about her. It's just been revived and started printing again, and I for one am thrilled. Not just because I like reading Wonder Woman one-shots (though this month, when she basically fixed Gotham forever was pretty rad), but because it gives the writers a lot more leeway to explore her character and find compelling angles to her characterization. Plus, Wonder Woman is one of the most recognizable superheroes on Earth. She deserves a second title so she can strut her stuff. Who knows? Maybe some of the material from this book will be compelling enough to finally be made into that movie that we know must happen someday please oh please come on. Like it says above, I came late to the Hawkeye train, and so I've opted to collect the trade paperbacks instead of the floppies. If this were a female-lead comic I'd probably buy the floppies just because, but it's not, and it doesn't need my help. Hawkeye is a pretty popular comic in its own right, and I think it's doing just fine without me. Also it's hilarious and wonderful and I love it. For reference, this is sometimes called Matt Fraction's Hawkeye, and it's not hard to see why. 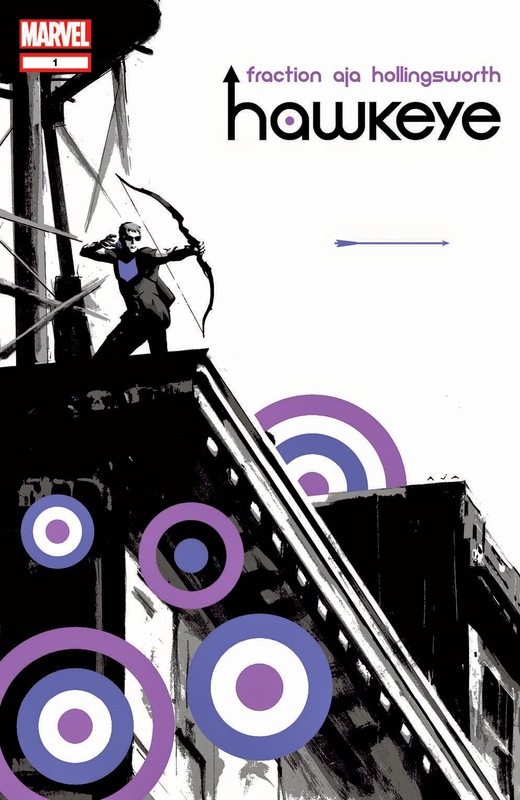 Just like Kelly Sue Deconnick has largely defined Captain Marvel in recent years, and Gail Simone is who everyone thinks of in terms of Wonder Woman, Matt Fraction has developed the definitive take on Hawkeye. And I am okay with that because his take is amazing. Basically, remember all the sass and snark we got from Jeremy Renner in Avengers? Well that's the comic. Clint Barton is a human disaster who thinks the best way to infiltrate a party is by wearing a suit and repeating the word "casual" under his breath. He has a one-eyed dog fondly named "PizzaDog", and his young mentee, Kate Bishop, is a more functional adult than him any day. Which is funny, because she's like eighteen. Technically the comic is about both Clint and Kate, but it's pretty clear that Clint is where the real story lies. And it's a good story. It's about what Hawkeye does when he's not being an Avenger. He doesn't have a swanky life or some big mission. Mostly he hangs out and gets into trouble with the Russian mob or accidentally pisses off some supervillain when he goes out for more pizza. He's smart (really smart), but also kind of dumb when it comes to common sense. And score one for representation, this Hawkeye is deaf and wears hearing aids, a piece of continuity I wish they would bring into the movies. Basically Hawkeye is the best like pizza is the best. It may not be the best thing in the world for you, but damn if you're not going to eat it anyway. 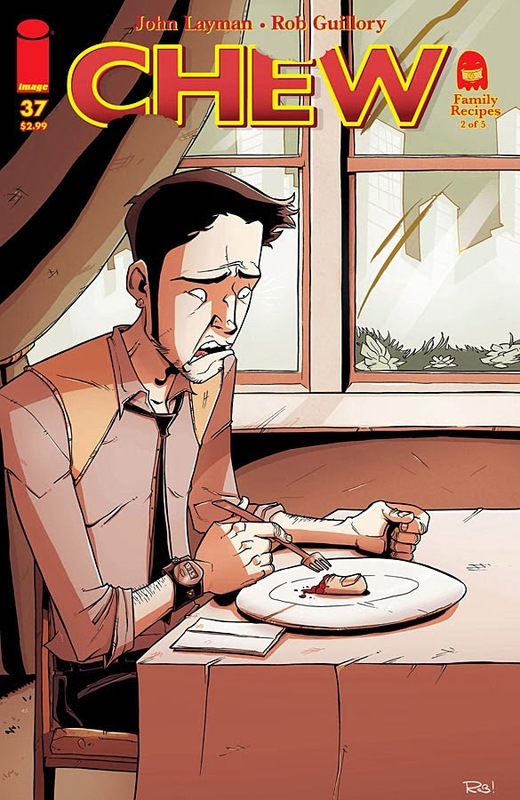 I have listed my deep and abiding love for Chew elsewhere on this site, but suffice to say that I really like this comic. It's weird and fun and cool and has deep and interesting characters and also a lot of science fiction insanity. It's about a world where chicken has been outlawed because of a bird flu epidemic. Our hero, Tony Chu, works for the FDA, investigating chicken-related crimes. He's a perfect candidate for the job because he's cibopathic: he has a superpower where whenever he eats something, he knows everything about how it was made and who made it. So he solves crimes. Occasionally by eating dead people. But that's really only the very basic gist of the show. For starters, there are a ton of food related superpowers revealed, including but not limited to: a woman who can write about food so vividly you can actually taste it, a woman who can see the future of anyone she bites, a man who gets smarter when he's eating, a man who can sculpt chocolate into realistic and usable weapons (including guns), and so on. It's deeply bizarre, and very fun. Right now the plot has expanded across the universe, something about how the thing with the chickens and this strange alien writing in the sky is actually about the end of the world? Also there's a minor character who is a cyborg rooster that happens to be the FDA's most decorated and efficient agent. POYO! It's a good book. You should read it. It's complicated. But good. That's what I'm saying. I can't really explain it to you in more detail, unfortunately, because I'm not convinced I understand it in more detail than that, but it's very entertaining, and honestly? The art is some of the most beautiful I've seen in a comic. Hands down. Emma Rios, the artist, is amazing and needs more work. Also she needs to keep drawing this comic too, because she's so good at it. I'm not really sure where the story's going to go from here, though. That's the one downside. I mean, I love the first volume, but it ends on a pretty resolved note, so I'm not sure what else there is to say. Still, I'm curious. 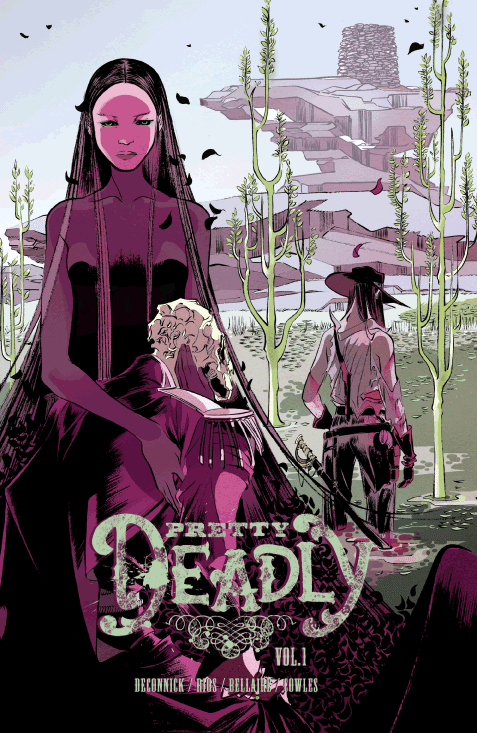 And if you like surrealist takes on the Old West and also death mythology, then you should like it too. I don't have much to say about these yet, because they haven't come out, and therefore I cannot vouch for them, but I am eagerly anticipating each and every one of these stories. (Okay, technically, Secret Avengers is already out, but I'm waiting for the trade paperbacks, and it could be another few months for that.) So yeah. Very excited. And, once again, feel free to note how much of this list is made up of Marvel and independent titles, and how little is DC. Interesting, eh? Favorite character in Bodies. Hands down. *Stories are wonderful and I will take them in whatever medium I can get them. I'm going to have to bookmark your pull lists, or something, for later. I'm just about to finish Locke and Key, and still have some online comics I'm trying to grind out, but a lot of these look awesome. Oh gosh, Locke and Key is so good! Personally, I'm waiting on edge to see how Nimona ends right now. That's my current favorite webcomic. What are you reading?